The Loveland High School (LHS) Jazz Orchestra spent three days with a full itinerary in Chicago in November. Among the highlights: a performance by the band in the Grand Hall of the Field Museum – one of the largest natural history museums in the world. 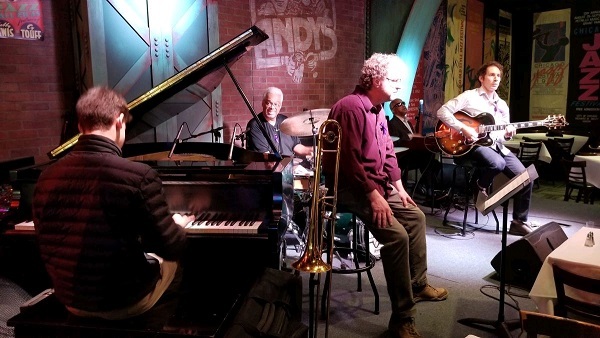 Chicago became home to some of the most influential jazz musicians of all times starting in the 1920s, and the abundance of small clubs continues to keep the jazz scene alive and thriving. The Loveland orchestra visited Andy’s, a staple for jazz lovers since the early 1950s, as well as the Jazz Showcase, which opened its doors in 1947. Relocated several times in the past 71 years, the Showcase has hosted many of jazz music’s great, including Art Blakely, Eddie Harris, and Dizzie Gillespie, who spent many of his birthdays performing at the club. Other highlights during the Chicago stay included seeing the Broadway show Hamilton at the CIBC Theatre and attending the annual Christmas tree lighting in Millenium Park. The students also toured several museums and tourist sites, including Navy Pier. The Loveland Jazz Orchestra performed at Caffe Vivace in Cincinnati on December 3, and is next scheduled to perform during the Holiday Band Concert at Loveland High School on December 12, 7:00 p.m.
Photo caption (top image): The Loveland Jazz Orchestra in Chicago, November 2018.